pyaz ki kachori recipe | onion kachori | jaipuri pyaaz kachori recipe with detailed photo and video recipe. a crisp and flaky deep-fried snack recipe made with plain flour and onion stuffing. khasta kachori is famous across india and is made with myriad stuffing including peas, moong dal and potatoes. 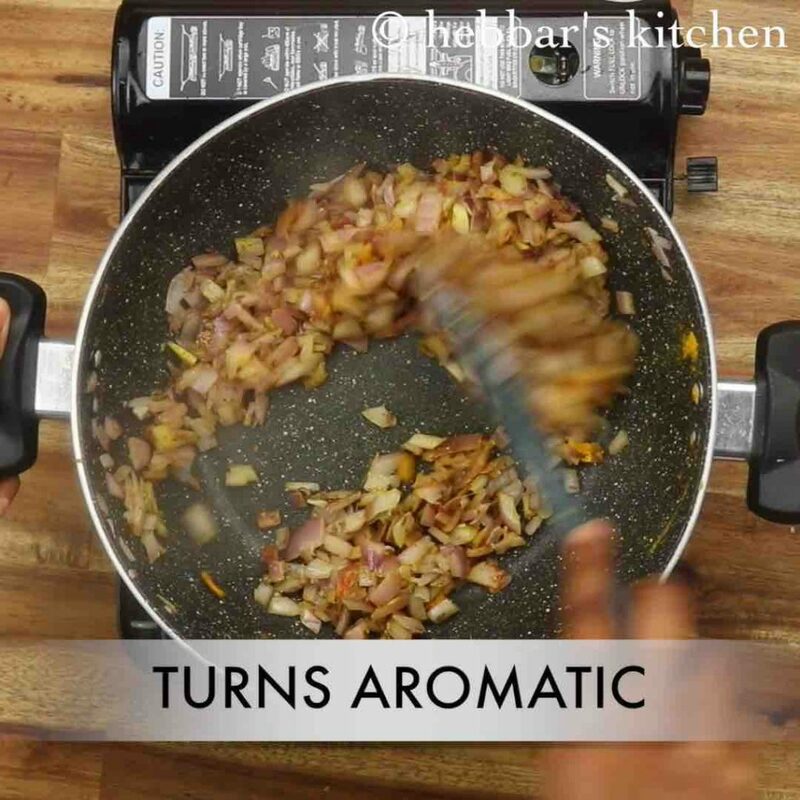 but this recipe of kachori is made with an easy and simple stuffing of spiced onions. pyaz ki kachori recipe | onion kachori | jaipuri pyaaz kachori recipe with step by step photo and video recipe. snacks recipes are very common across india and can be made with various ingredients. each region has its own unique and speciality which is either served for breakfast or as an evening snack. pyaz ki kachori is very native to rajasthan and is famously served as a street food with other chaat recipes. i am not a huge fan of kachori recipe, and i most of the time end up having various types of deep fried samosa. perhaps its the stuffing of samosa makes me crave more and more. having said that, i have a special place for pyaz ki kachori recipe, and it is mostly due to its onion based stuffing. generally, the stuffing for kachori made with moong dal, peas or even potatoes makes it a dry snack with very little moisture. but the onion has some moisture and thus making it juicy at the same time flaky and crisp. 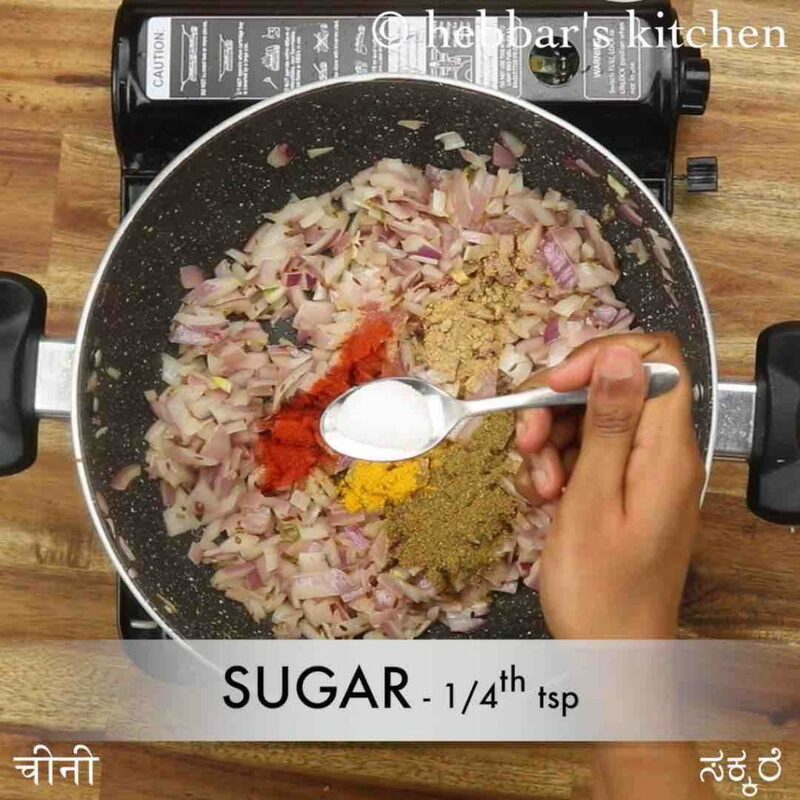 in addition to it, the chaat recipes made out of onion kachori are more flavoured and tasty compared to others. hence most of the time i end up making this kachori well ahead in advance and can be served as a snack or chaat dish with chutney and sev toppings. 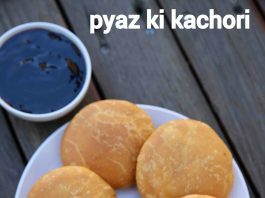 there isn’t anything complicated with the recipe steps, yet some tips and suggestions for flaky pyaz ki kachori recipe. 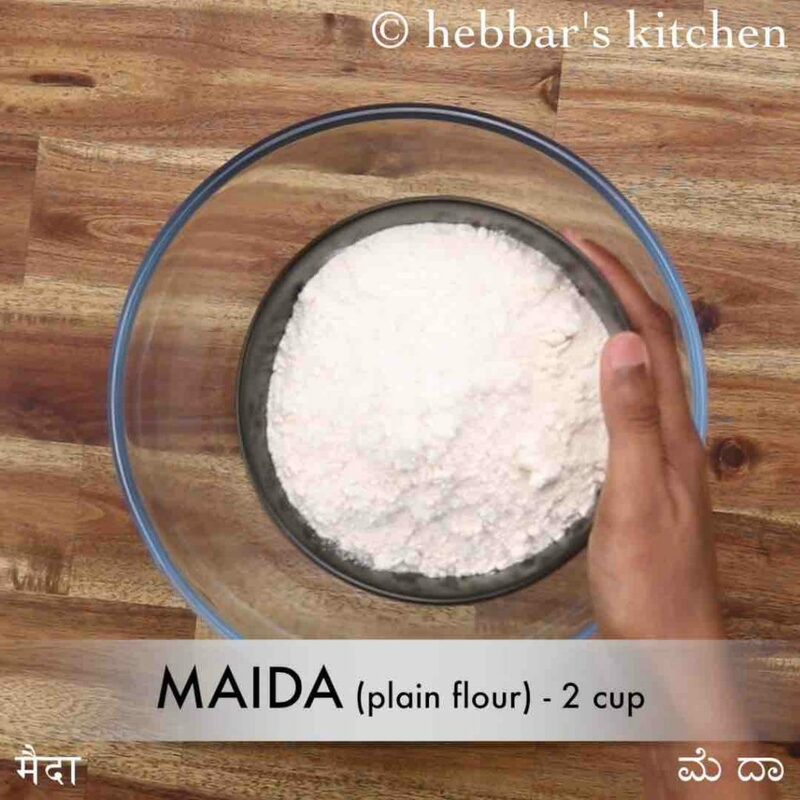 firstly, the kachori recipe is always made with plain flour or maida which in turn results in a crisp and flaky texture. 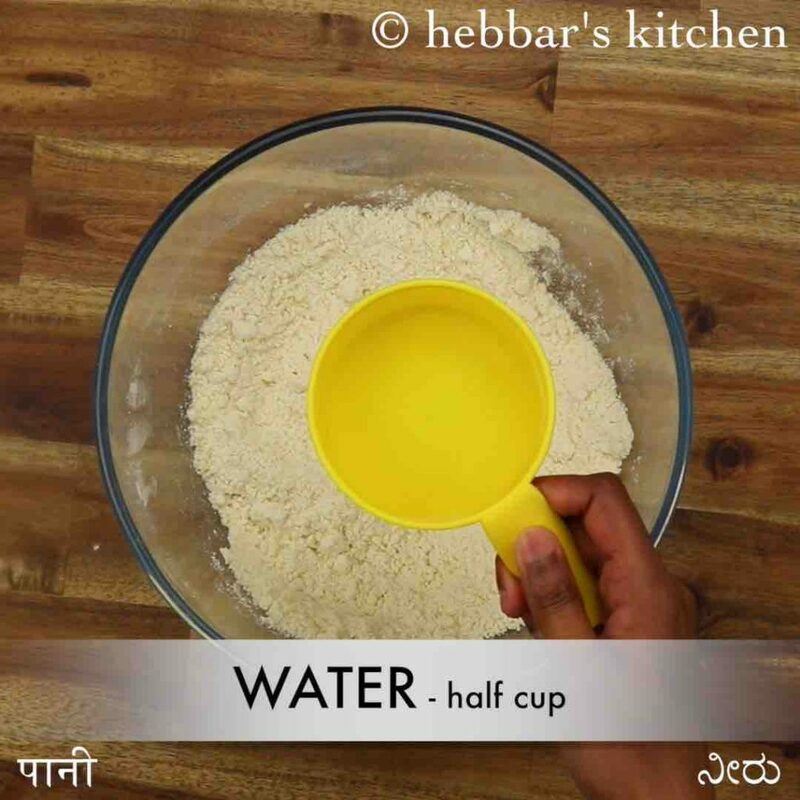 but even wheat flour or atta can also be used as an alternative to make kachoris dough. 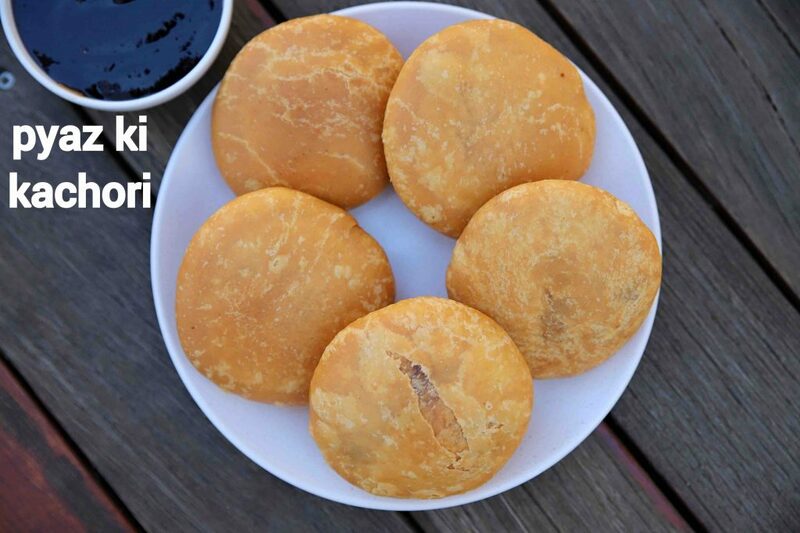 secondly, deep fry these kachoris in a medium heat oil so that it evenly cooks inside and outside. do not cook on high heat as it would cook only the outer layer and may not cook the inner layer. 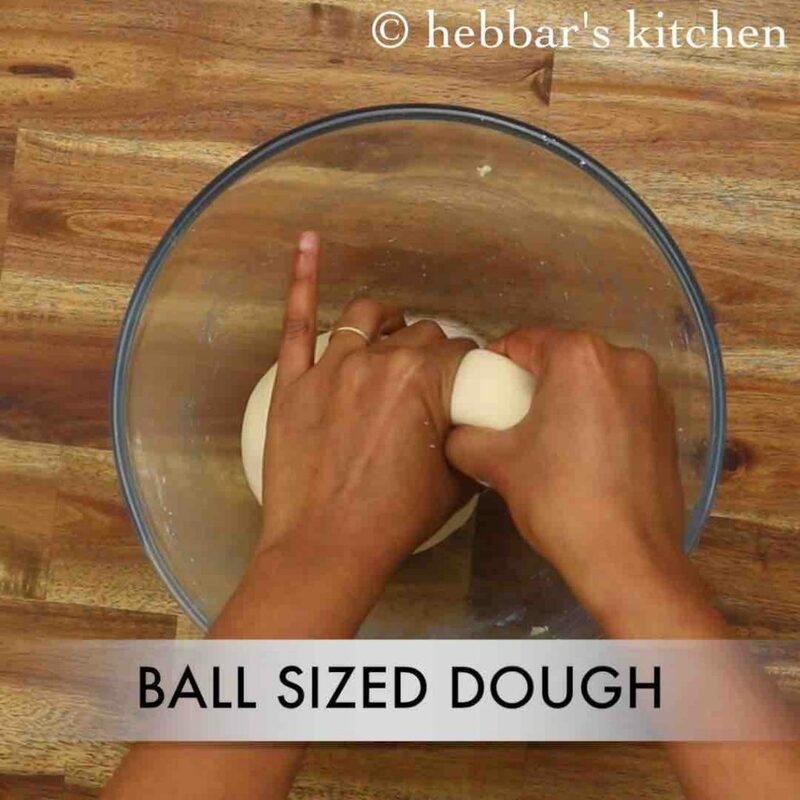 finally, make sure to make a tight dough by adding very little water in small batches. 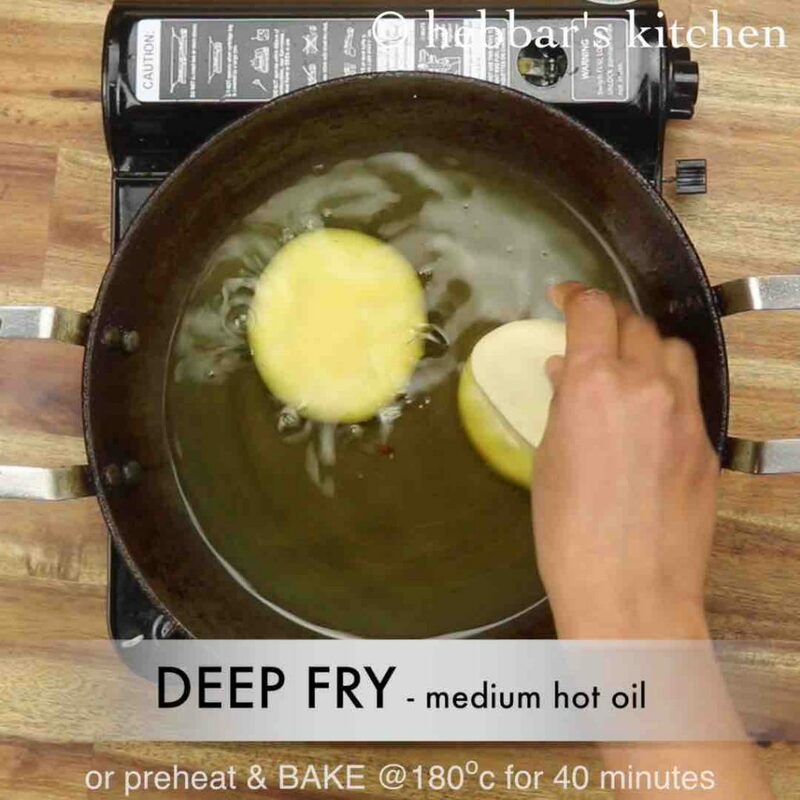 more moisture means more oil absorbing while deep frying. firstly, pinch a small lemon sized ball and flatten it. now scoop 1 tbsp of prepared pyaz stuffing and place in the centre. get the edges together and form a bundle. close the top by pressing and flattening. 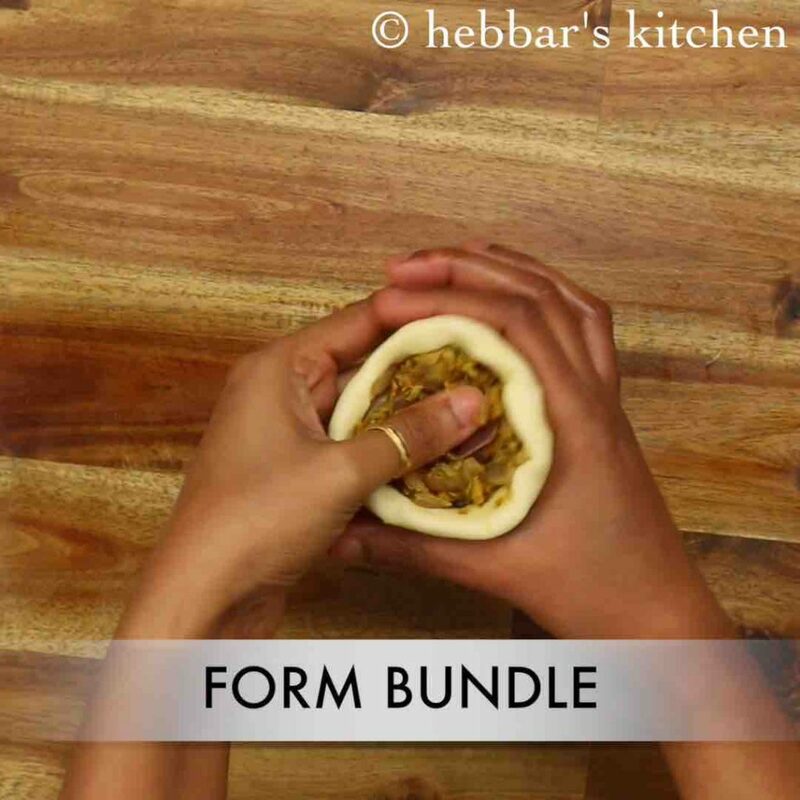 furthermore, gently press the edges and flatten to form a poori size. 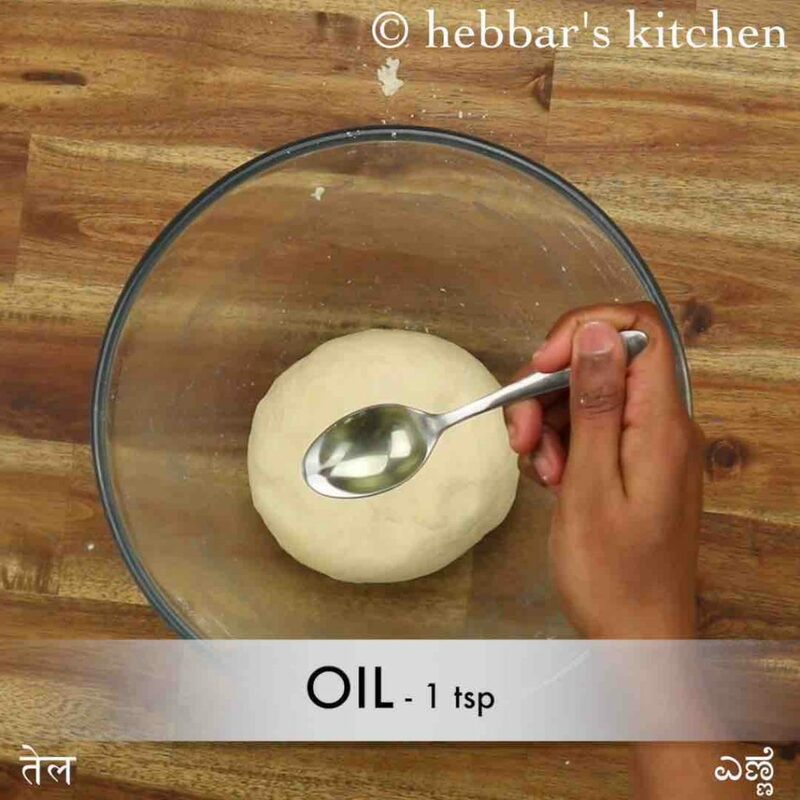 when the oil is medium hot, add prepared kachori. do not touch it for a minute or till they float. then press with the spoon to puff up. 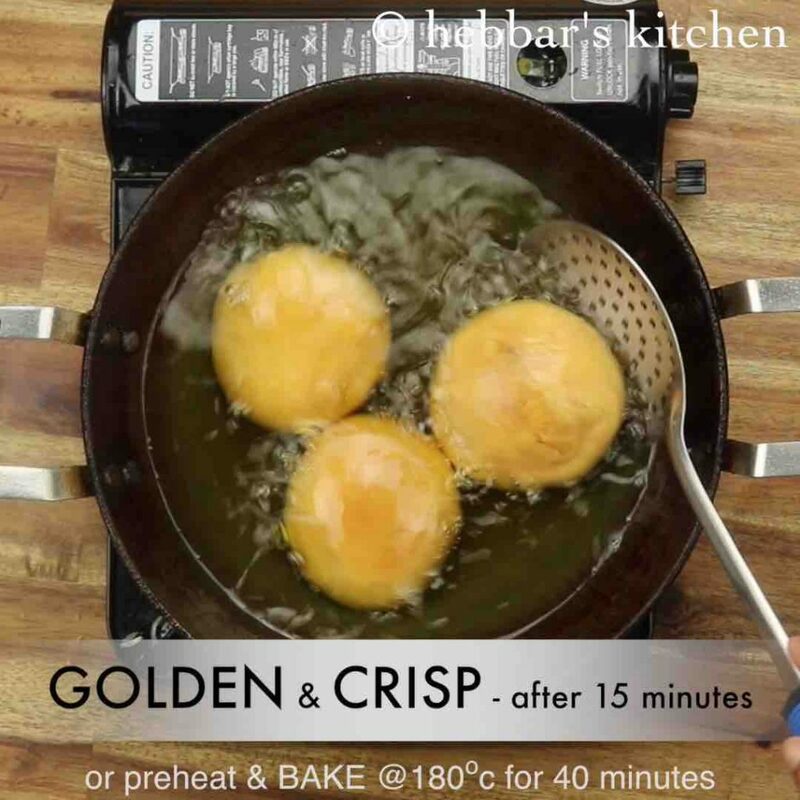 turn around and fry the kachori till it turns golden brown all over. finally, serve pyaz kachori as it is or with green chutney and tamarind chutney. firstly, prepare the dough by taking 2 cup maida, 1 tbsp rava and ½ tsp salt. mix well. 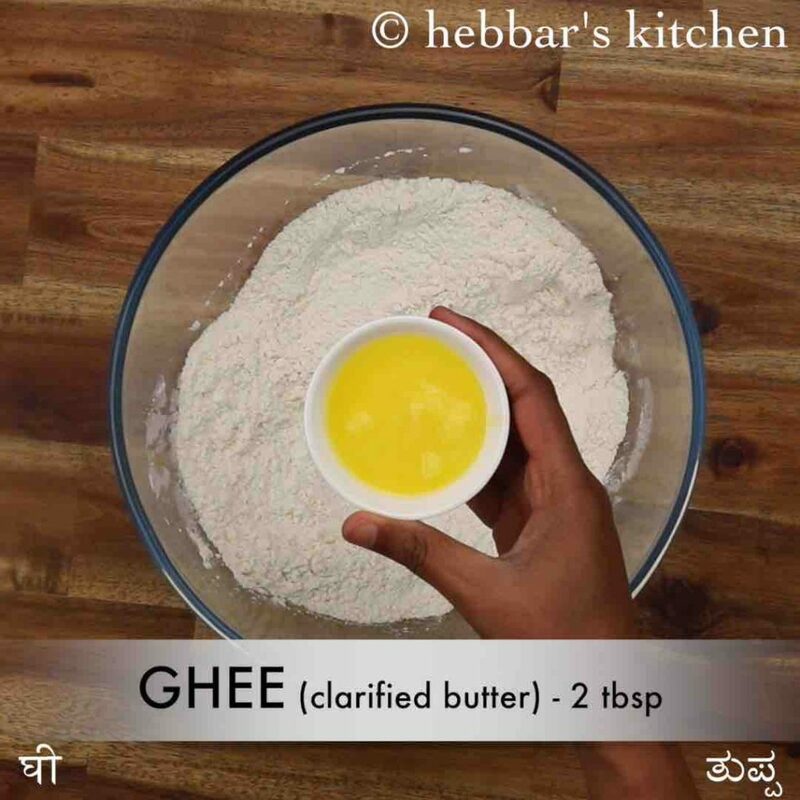 further, add 2 tbsp ghee. crumble and mix well making sure the dough holds shape. in addition, add water little by little and knead. 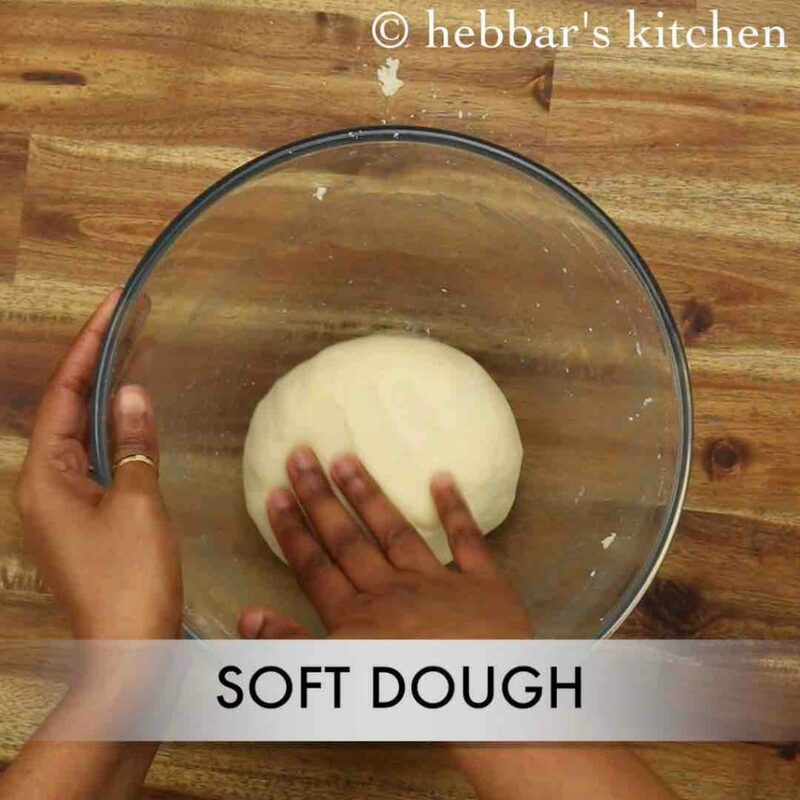 knead well till you form a smooth and soft dough. furthermore, grease 1 tsp oil. cover with a moist cloth and keep aside for 20 minutes. 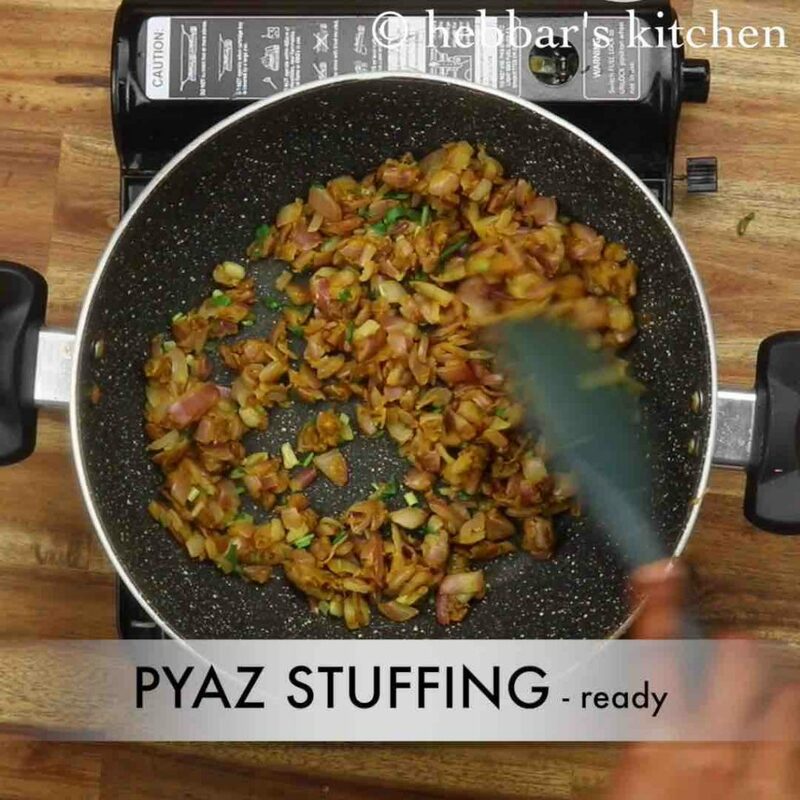 prepare the stuffing by heating 3 tsp oil and saute ½ tsp cumin, ½ tsp coriander seeds, ½ tsp fennel and pinch hing. 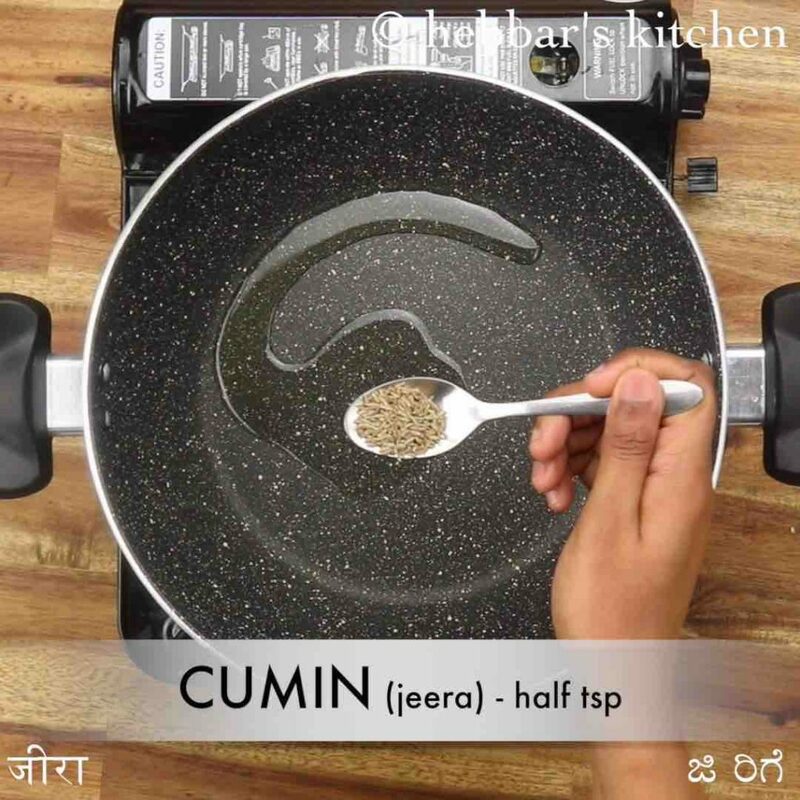 saute till it turns aromatic. 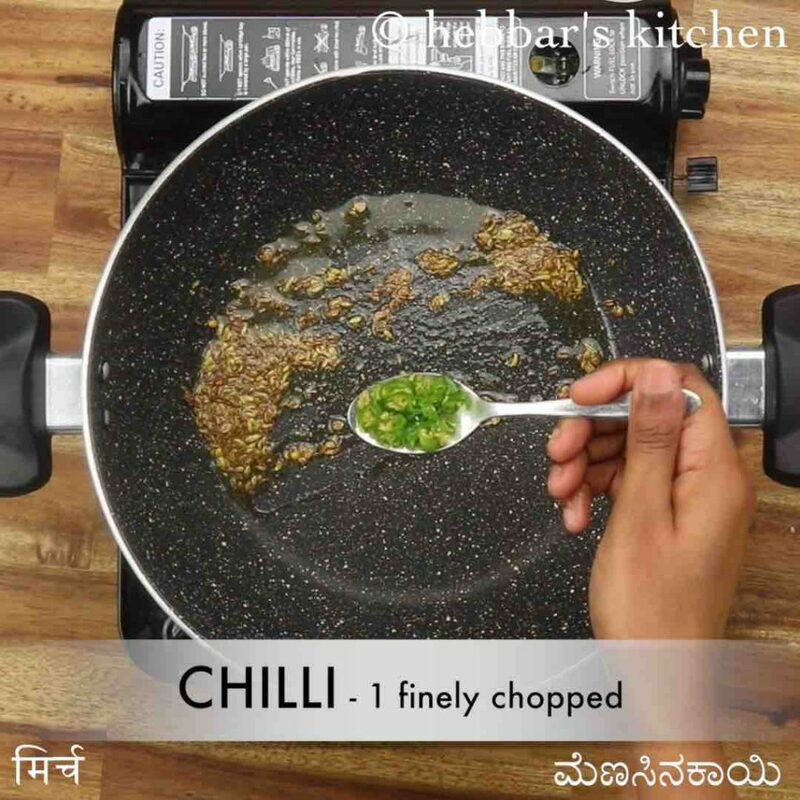 now add 1 chilli, ½ tsp ginger paste and saute for 30 seconds. furthermore, add 2 onion and saute until it changes colour slightly. 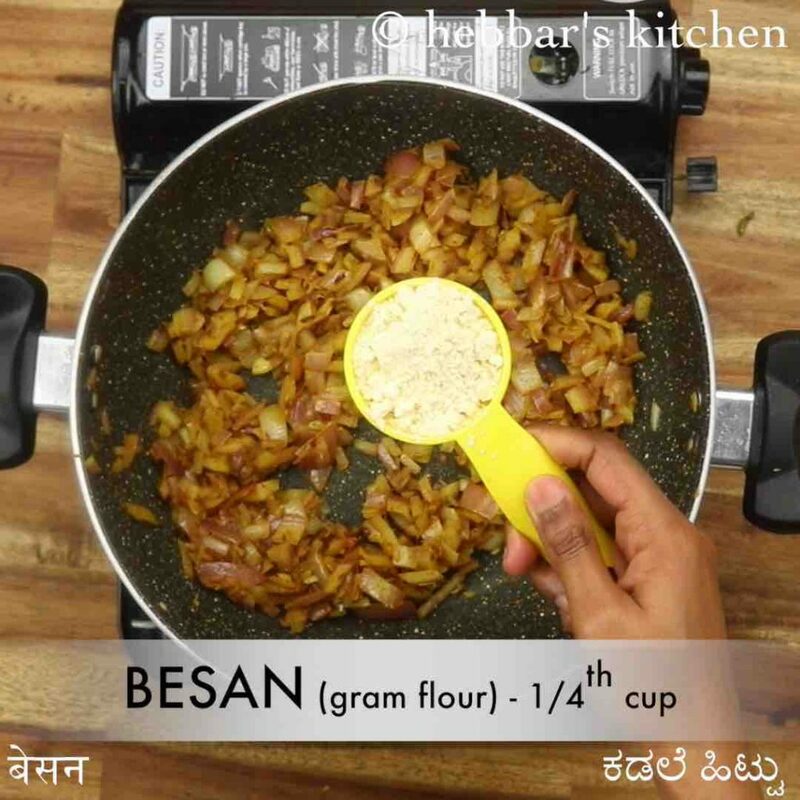 keeping the flame on low, add ¼ tsp turmeric, ¼ tsp red chilli powder, ½ tsp garam masala, ¼ tsp aamchur, ¼ tsp sugar and ½ tsp salt. saute on low flame till it turns aromatic. additionally add ¼ cup besan and roast well. 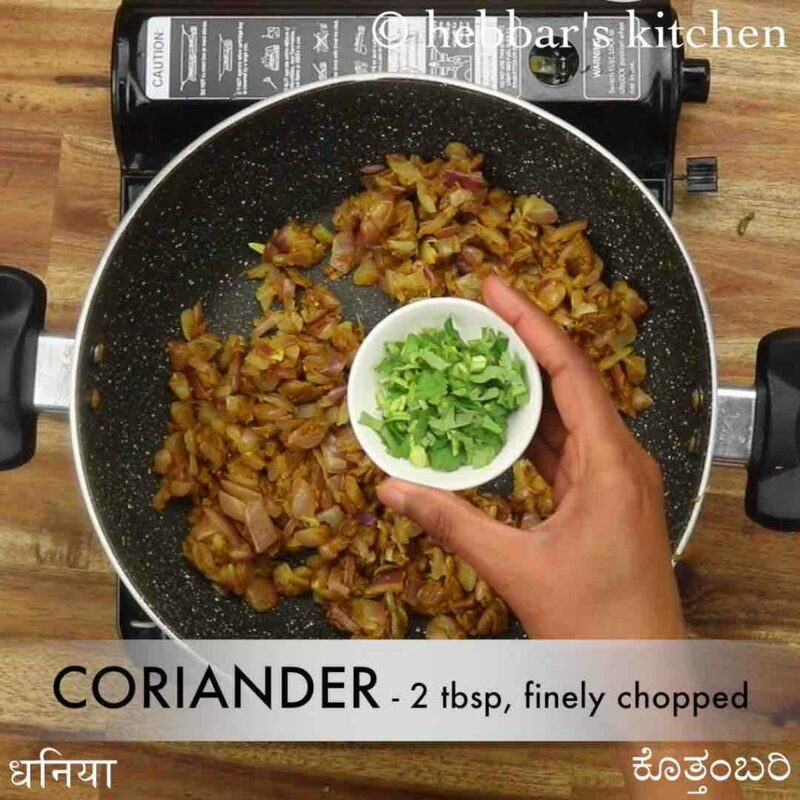 add 2 tbsp coriander and mix well. finally, onion stuffing is ready. allow to cool completely. now pinch a small lemon sized ball and flatten it. 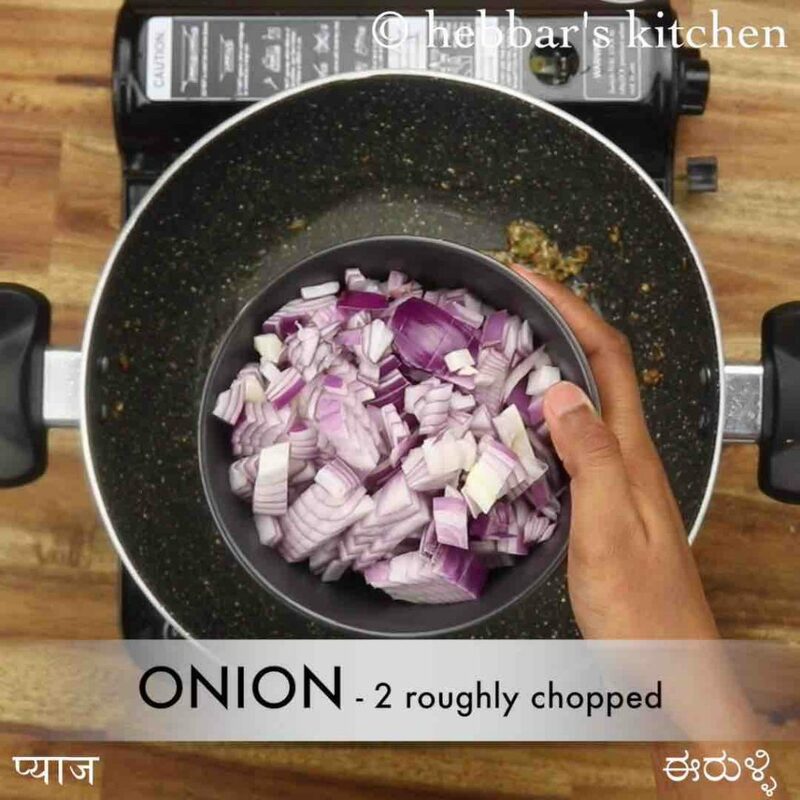 firstly, fry onion kachori on medium flame else they will not be crispy. 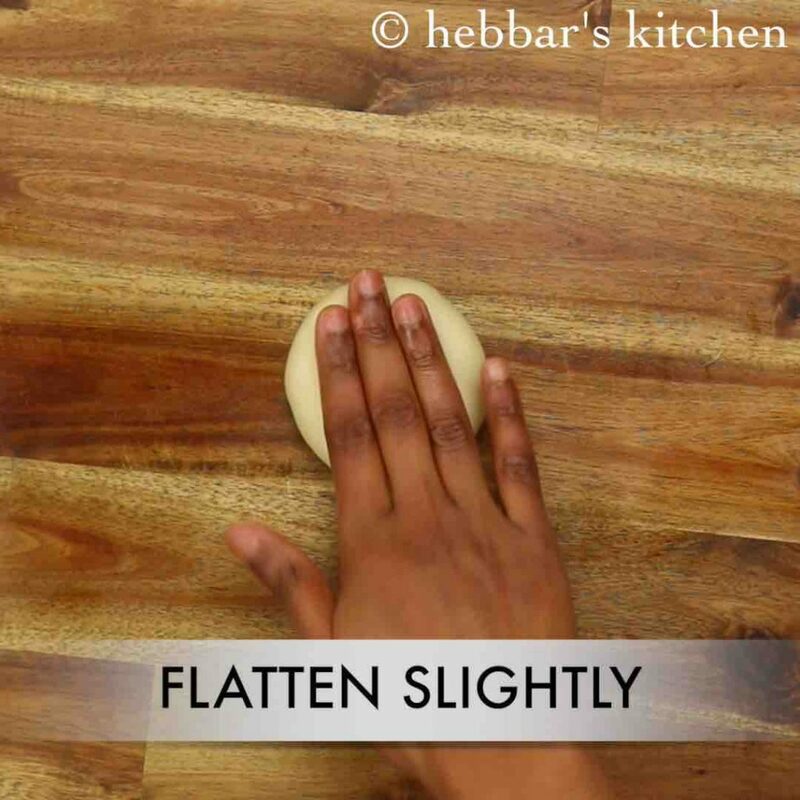 furthermore, you can use a rolling pin to flatten kachori. additionally, you can alter the filling according to your preference. 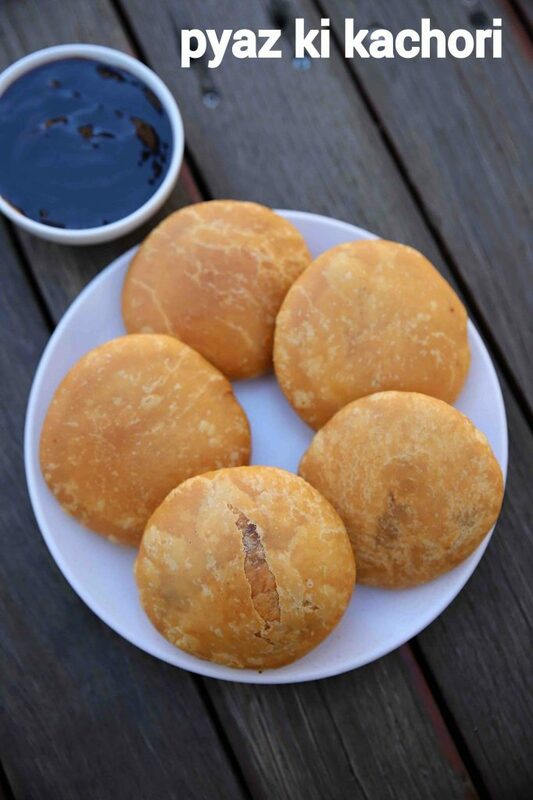 moreover, kachori is perfect when oil / ghee is added while kneading the dough. finally, you can store these in an airtight container and prepare pyaz ki kachori chat.